Dr. Dharamvir Bharati was a renowned Hindi poet, author, playwright and a social thinker of India. He was the Chief-Editor of the popular Hindi weekly magazine Dharmayug, from 1960 till his death in 1997. Bharati was awarded the Padma Shree for literature in 1972 by the Government of India. His novel Gunaho Ka Devta became a classic. Bharati's Suraj ka Satwan Ghoda is considered a unique experiment in story-telling and was made into a National Film Award- winning movie by the same name in 1992 by Shyam Benegal. Andha Yug, a play set in the time immediately after the Mahabharata war, is another classic that is enacted very often in public by various drama groups. 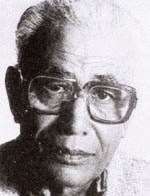 He was awarded the Sangeet Natak Akademi Award in Playwriting (Hindi) in 1988, given by Sangeet Natak Akademi, India's National Academy of Music, Dance and Drama. Dharamvir Bharati was born in 25 December year 1926 Allahabad to Chiranji Lal and Chanda devi. The family underwent considerable financial hardships after his father died early. He had a sister, Dr. Veerbala. He did his MA in Hindi from Allahabad University in 1946 and won the "Chintamani Ghosh Award" for securing highest marks in Hindi. Dharamvir Bharati was the sub-editor for magazines Abhyudaya and Sangam during this period. Later he completed his PhD in 1954 under Dr. Dhirendra Verma on the topic of "Siddha Sahitya", and was appointed lecturer in Hindi at the Allahabad University. The 1950s were the most creative period in the life of Dr. Bharati and he wrote many novels, dramas, poems, essays, and criticism-works during this phase. In 1960 he was appointed as chief-editor of the popular Hindi weekly magazine Dharmayug brought out by the Times Group, and moved to Bombay. He remained the editor of Dharmayug till 1987. During this long phase the magazine became the most popular Hindi weekly of the country and reached new heights in Hindi journalism. As a field reporter, Bharati personally covered the Indo-Pak war that resulted in the liberation of Bangladesh. Dr Bharati married in 1954 and later divorced Mrs. Kanta Bharati with whom he had a daughter Parmita. A Few years later he remarried and had a son Kinshuk Bharati and a daughter Pragya Bharati with Mrs. Pushpa Bharati. Dr. Bharati developed heart ailments and died after a brief illness in 1997.